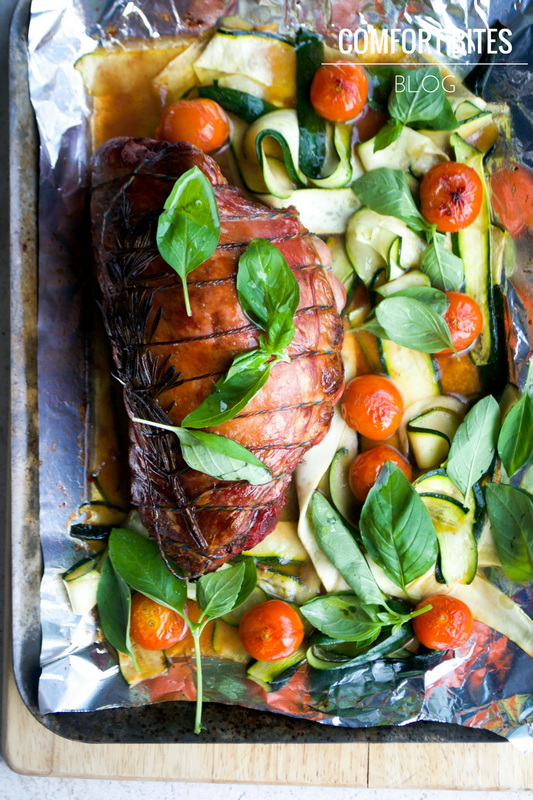 A boned and rolled leg of lamb, roasted and served with zucchini, cherry tomatoes, lemon and basil. And ready in an hour and a half. I received the lamb and a contribution towards the ingredients for this recipe from Farmer's Choice. I love the quality of their meat and have been cooking with it for over a year. I hope you love it. You'd usually look at a meal like this and think it had taken ages - hours, to make. You'd have to save up and wait for a Sunday where you weren't doing anything or going anywhere, so you could stand in the kitchen all day and make this for your dinner. This boned, rolled leg of lamb with beautiful veggies took just under an hour and a half to cook. And for most of that time, I wasn't doing anything with it. I just slid it into the oven and then prepped the veg and roasted it in the last half an hour. I learned about using the fat from the roast to bring flavour to the vegetables when I went to see Bryn Williams. 'Fat is flavour', he kept saying. The veggies cook in the juices from the lamb roast, and so they really absorb the sweet, umami flavour. You've got to try it. AIPers, you can just skip out the cherry tomatoes. The rest is compliant for you. Oh, and have a look at that lamb crackling. Preheat your oven to gas mark 9/245ºC/475ºF and get out a shallow roasting tray. Line with foil, to help with washing up. Lay the leg of lamb onto the foil, sprinkle with the salt, and slide into the oven, roasting at high temperature for 30 minutes. Turn the heat down to gas mark 5/190ºC/375ºF and roast for another 15 minutes. Once the 15 minutes are up, take out the lamb and place the hot tray on a trivet or board. Arrange the courgette/zucchini ribbons around the lamb and toss in the juices from the roast. Dot the cherry tomatoes around and turn them in the cooking fat so they turn glossy. Sprinkle the veg with a little more salt and slide back into the oven for another 30 minutes. Once the time is up, take the lamb out of the oven to rest. Double check it's cooked through. It might be slightly pink in the centre, this is fine. If you want it cooked a bit more well done, slide it back in for another few minutes. 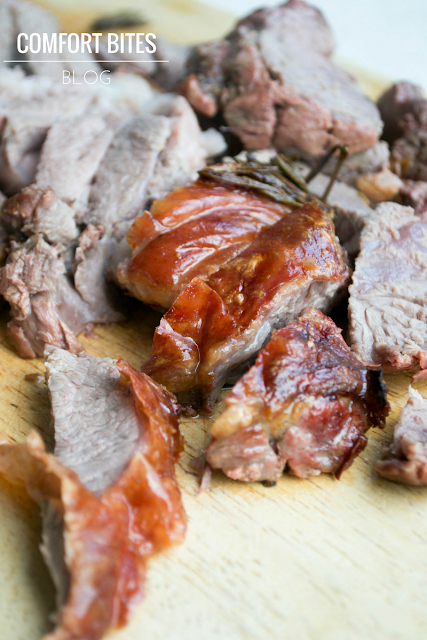 Once the lamb is cooked, mix together the lemon juice and the olive oil and pour all over the hot lamb and vegetables. 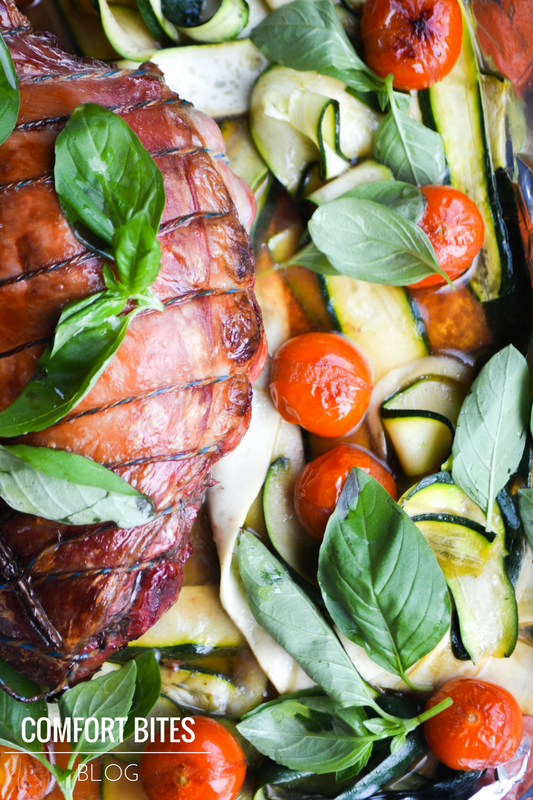 Scatter the basil leaves over and serve, transferring the lamb to a chopping board to carve. This post was created using Farmer's Choice lamb. Do go and check out their website, I love the quality of their meat and fish.